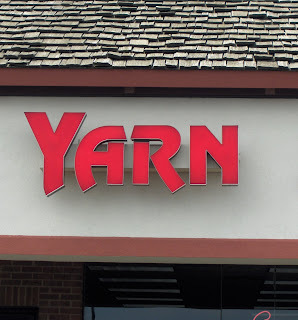 Today is my last day of my family free vacation so I headed to the yarn store to do some shopping. I went in looking for a birthday gift for my eldest turning 11 in about a month. 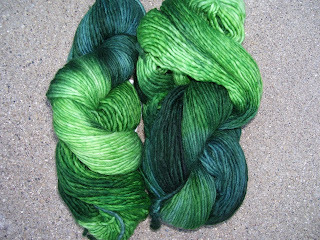 It's Malabrigo in the Verdes(203) colorway. I'm hoping to persuade him to make "my so called scarf" with it but he's free to knit whatever he likes with it. The hard part is keeping him from finding it until October. 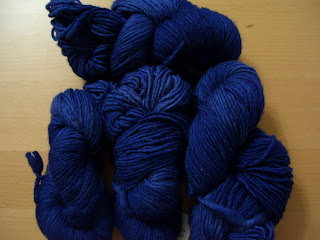 It's Malabrigo in the Buscando azul(186) colorway. I can't wait to see how it knits up. Do you like sock yarn? KnittingHawkeye's Etsy shop is running the Cuaran Sock Club from October '07-June '08. 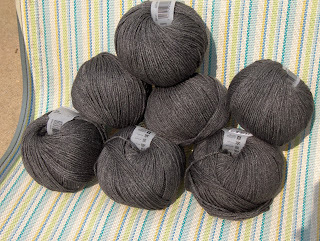 Each shipment will be sent out every other month for a total of 5 skeins of yarn and 5 patterns plus lots of extras. I'm sewing up some sock bags for her club members and the fabric she chose arrived today. She included a skein of MacKintosh Yarn in the Ginny colorway. It's a superwash merino/bamboo/nylon blend and it's beautiful! Thank you KnittingHawkeye! 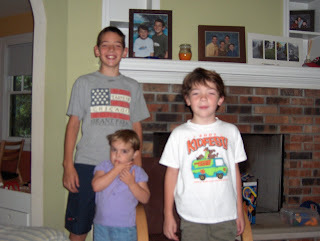 I hope everyone has a great holiday weekend. I've been knitting on my husband's Manly Maze sweater the past few days. Today I finished the color work and separated for the sleeves. It's a bit ironic that I picked a pattern from a vegan knit book yet I'm using a wool/cashmere yarn. 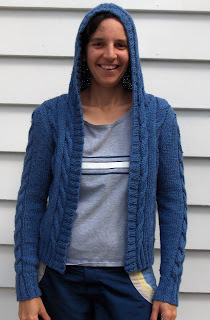 I picked up Rowan Cashsoft DK for this sweater at a LYS sale. I've had 6 knots in the 4 skeins I've used so far. I hate it when they sneek up on me too. I wanted to reach the boring stockinette portion of this sweater before my 28 hour train trip next week. This sweater is not as portable as a sock might be but I think it may travel along. So what's on your needles today? You know you're getting old when the weather is the first thing you write about in your blog. I've seen enough rain in the past two weeks to last me a while. Thankfully our basement is a concrete floor and water "seeped" not flowed into it. We were also lucky we didn't have any downed trees in this storm. Now if it could please stop raining so we can enjoy the last week of the summer by the pool. I finished up my Fifi sweater a couple of weeks ago. 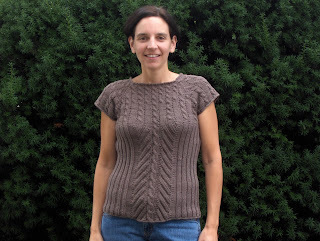 I used Lion Brand Cotton Ease in Taupe. It took about 3.5 skeins to make my Fifi. I made the 33.5" size and used size 7 bamboo circular needles. The only modification from the written pattern was adding about six inches onto the length. 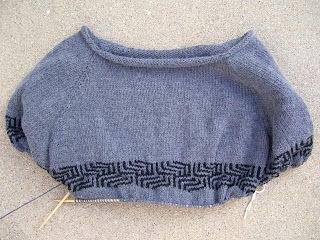 I love top down/no seaming patterns. I didn't realize how much I liked it until I picked up another UFO this past week. 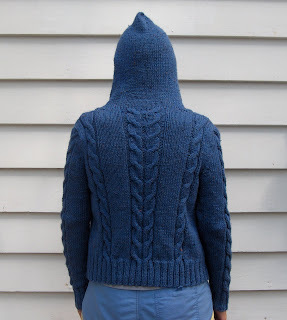 My Central Park hoodie was a seaming nightmare but I finished it up this week. You can't really tell just how small it is until I turn around. I made the 36" size and used size 8 bamboo circular needles. I used about 5.5 skeins of Kraemer Yarns Tatamy Tweed Worsted(a cotton/acrylic yarn) in Sea Blue. This yarn may have been easier to knit with different needles as my bamboo needles split this yarn very easily and this made it extremely frustrating to work with. I worked five button holes on one side but I'm not sure I'll bother sewing on buttons. I'm off to swatch and cast on for two more sweaters. 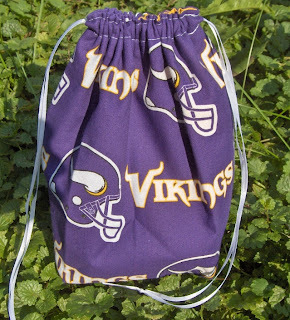 This one is headed to a Football fiber fan living in Iowa but loves Minnesota(and whoever is playing the Packers). Yes I am now known as the bag lady at my house and my local post office. We had house guests over the past five days so not much sewing was happening but it was nice to get cousins together and catch up with my sister. Her daughter is 3 and was very interested in what I was knitting on and who it was being made for. The hazard of leaving a project for awhile is remembering where you left off. Case in point is my cardigan that I put aside back in June. I picked it back up last week and started knitting on the hood. About 20 rows into the hood I noticed the cables were all off. So I placed it back into the "later" pile and knit up some more dishcloths. Now that the house guests have left I'm digging it back out to finish it so I can cast on for two other sweaters in my queue. It's Rowan Cashsoft 4 ply. It's a merino,microfiber,cashmere blend that's still machine washable and really soft. And it only cost $50 which he still thinks is outrageous price but once I knit it up I'm sure he'll love the feel of it. And the color of the fair isle work. Yep, you guessed it-BLACK!